Partitioning enhances the managability and availability of applications. Partitioning is nothing but splitting a huge table into multiple partitions. 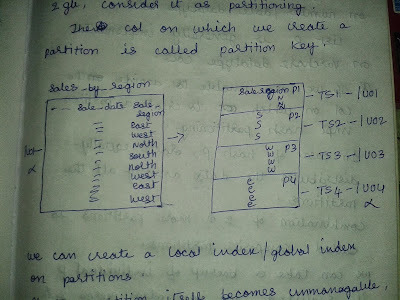 Once we implement the concept of partitioning, each partition access a independant segment on its own. At the time of creating a partition, see that each partition resides in a separate tablespace and goes into separate file system. Ideally, if the table size goes beyond 2gb, consider it as partitioning. The column on which we create a partition is called "partition key". We can create a local/global index on partitions. 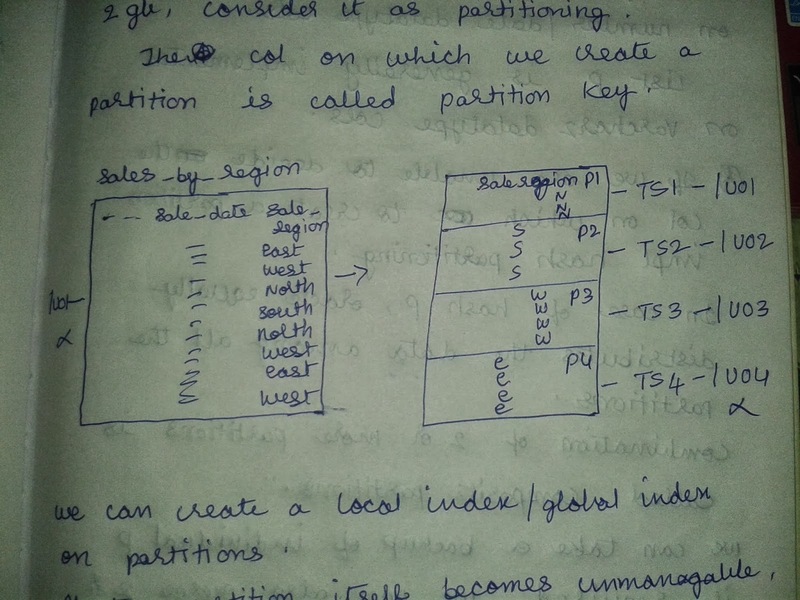 If the partition itself becomes unmanagable, implement the concept of sub partitioning. Range partition is generally implemented on number/date datatype columns. List partition generally implemented on varchar2 datatype columns. Note: If we are unable to decide the column on which to create a partition implement hash parttioning. In case of hash partitioning, oracle equally distributes the data among all the partitions. Combination of two or more partitions is called composite partitions. We can take a backup of individual partitions if required, we can also merge two or more partitions if required.